Cancer metastasis–the spread of cancer cells to distant organs–is what kills the majority of cancer patients. In order for cells to metastasize, they must acquire an invasive and motile phenotype, degrading and moving through tissue barriers. In addition, they must be able to survive and grow at distant sites in the body. 1) Induction of invasive protrusion formation by deregulated signaling. Figure 1: Breast cancer cell stained with rhodamine-phalloidin to reveal filamentous actin (left panel) at sites of invasion into extracellular matrix (middle panel: FITC-fibronectin). Right panel: merge of images. Figure 2. 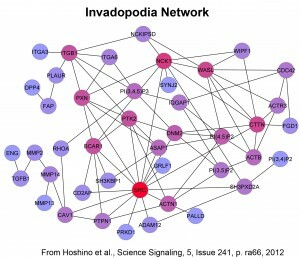 A molecular interaction network model of invadopodia. Each circle (node) represents a molecule and each line (edge) represents a binding interaction. Nodes that are more highly connected to other nodes are colored in red. Connectivity analysis can be used to identify driver hubs and novel regulators. Secretion of proteinases, extracellular matrix, and other factors is important during cancer and drives such critical tumor processes, such as invasion, blood vessel formation, and recruitment of stromal cells. Our recent data suggest that specialized secretion is an integral component of cell motility and invasive processes. Interestingly, we recently found that invadopodia are specific docking and secretion sites for exosomes. Exosomes are late endosome-derived extracellular vesicles that are now known to promote various aspects of tumor progression, including angiogenesis and creation of pre-metastatic niches. These data suggest that creation of invadopodia not only promotes proteolysis of the extracellular matrix but also facilitates multiple aspects of tumor progression by enhancing secretion of exosomes. We are currently following up on these findings to understand both how these docking sites are created and the impact for various cellular and tumor phenotypes. Figure 3. Model of exosome secretion at invadopodia. Exosome-carrying multivesicular bodies are docked at invadopodia and secrete growth factor and proteinase-containing exosomes that enhance invadopodia stability, activity and lead to additional de novo invadopodia formation. Exosomes carry not only protein but also RNA cargoes, including miRNAs. Delivery of RNAs in exosomes has the potential to alter gene expression in the tumor microenvironment and even induce transformation; however more characterization needs to be performed to define which RNAs are enriched in exosomes and whether they are functional. 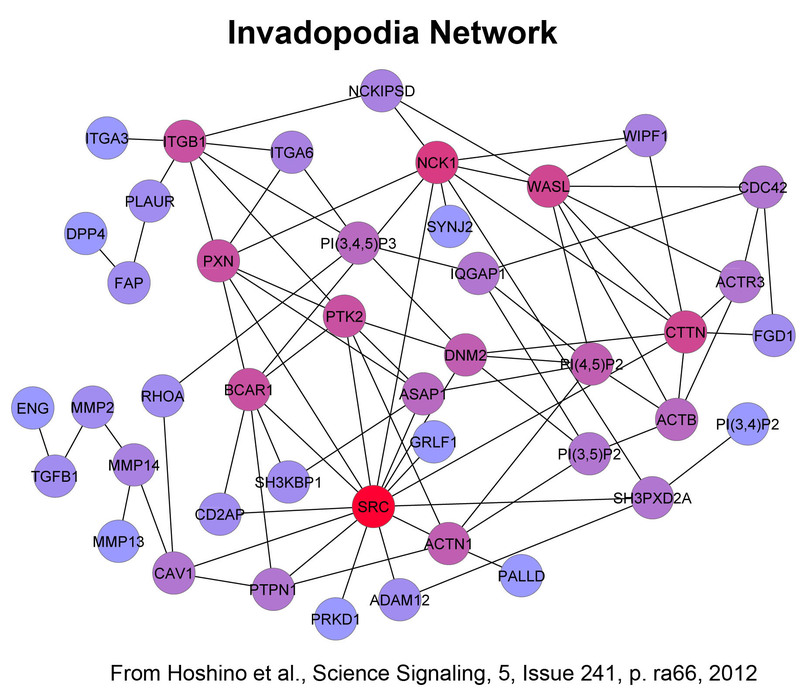 A key to understanding this process is identification of RNA scaffolding and trafficking routes in the cell, as how they are regulated by cancer cell signaling. Our project focuses on the cell biology that underpins the deregulation of this process in colon cancer. This project is part of a national consortium program focused on understanding multiple aspects of extracellular RNA. Mckenzie AJ, Hoshino D, Hong NH, Cha DJ, Frankling JL, Coffey RJ, Patton JG, Weaver AM. “KRAS-MEK Signaling Controls Ago2 Sorting into Exosomes.” Cell Reports, S2211-1247(16)30387-4, 2016. PMID: 27117408.